If you haven't been to New York's Chelsea Market lately, go. I hadn't been for some time, so I decided to make a brief expedition to see what's up. And it turns out that a fair amount is. I ate at Friedmans Lunch, and had an outstanding Southwest turkey burger (maybe the best I've had) with delicious herbed fries, accompanied by an excellent mint iced tea. Not the place to go if you're in a hurry, but you get the feeling that the slowness is the result of the care with which the foods, including a nice variety of salads and sandwiches, are prepared. Then I finished off with a spin through Bowery Kitchen Supply, which has some professional items as well as a nice, if quirky, selection of pots, pans and gadgets. Lying between 15th and 16th Streets and 9th and 10th Avenues, the Chelsea Market is relatively accessible and well worth the trip. A friend was attempting to make chocolates and I asked "Do you temper?" He didn't know what I meant, but I recalled that it has something to do with cooling and reheating chocolate so it will keep its shape without being refrigerated and attracting that dull surface that the fridge causes. I got intrigued, did some research and found two methods in Sherry Yard's Dessert by the Yard. Basically, tempering involves three simple steps: (i) melting chocolate (about 115º F), (ii) letting it cool to 84º F and (iii) reheating it gently to 89º or 90º F. These numbers are for semisweet or bittersweet chocolate; lower ones apply for milk chocolate. You can do the heating in the microwave (using short bursts and checking often) or in a double boiler. I tried both methods but in the end prefer using a double boiler with a remote digital roast thermometer. After tempering the chocolate, you can use mold to form it or just drop it neatly on a silicon pan liner (I use a squeeze bottle for this). Wait until it sets, about 1/2 hour, unmold and that's it. Or, add something on top of the chocolate while it's still warm; nuts and dried fruit to make mendiants or, as I did, fleur de sel or crushed caramel made with pepper. It turns out this is easy to do and you get a gorgeous result. I recently made a simple and delicious Cajun Chicken and Sausage Jambalaya that I saw Emile Stieffel make on Throwdown with Bobby Flay (he defeated Bobby). It is composed of boneless, skinless chicken thigh meat, andouille sausage (I used a combination of Niman Ranch and Aidell's) and tasso ham, with chopped basil and parsley and lots of white and black pepper. Following Mr. Stieffel's recommendation, I served it with dried red peppers and assorted hot sauces on the side. Most of the diners found it hot enough without, but two of us tried some sauces. My preferred sauce was classic Tabasco, but the other adventurous guest liked the Tabasco Chipotle Pepper Sauce. The recipe is clear and takes about 90 minutes to prepare. The whole thing comfortably makes two meals for 6, and you can easily freeze half at the stage when all the meats are cooked but before the stock and rice are added. Not being from New Orleans, I can't vouch for its authenticity, but this is an excellent Jambalaya. 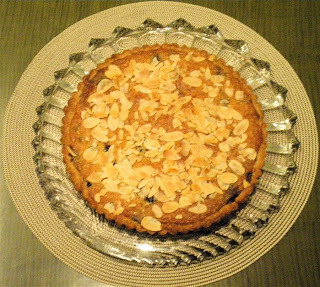 I made Clotilde's Tarte Amandine à la Myrtille last night. 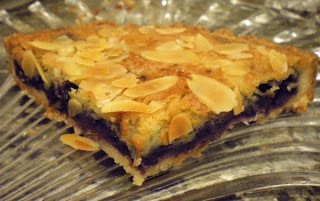 Just her excellent pâte sablée, with a layer of frozen wild blueberries topped with almond filling. Maybe the best tart I have ever made. This recipe is not on Clotilde's blog, Chocolate and Zucchini, so you have to buy her cookbook with the same name. I made Clotilde's yogurt cake last weekend, and have been having fun with it ever since. This is an easy and light but deliciously moist cake. Clotilde says it can be consumed plain, and Elizabeth Bard, author of Lunch in Paris, agrees, but my wife didn't and I, too, thought it needed something. 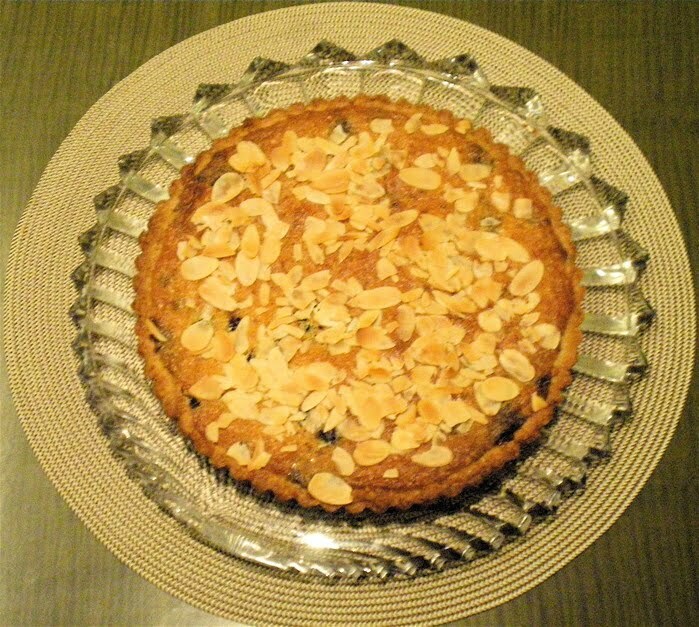 And both Clotilde and Elizabeth offer suggestions to enhance the cake. I didn't follow their specific suggestions, but the point is that this is an excellent base that can be turned into something special. So, I toasted it for breakfast: delicious. And I cut it into two layers and added seedless raspberry jam as a filling: I think I underdid it but a definite improvement. Finally, I cut it into two layers, soaked them on the inside with Limoncello, then reassembled after filling with unsweetened Greek style yogurt and topped with a lightly cooked blackberry sauce and a little grated lemon zest: a satisfying and reasonably light dessert. This cake is definitely worth adding to the repertoire, but expect to dress it up a bit.